(Photo courtesy of McNaughton Fine Art Company) Provo painter Jon McNaughton's latest work, "You Are Not Forgotten"
Conservative Provo artist Jon McNaughton has turned his brushstrokes into brushes with fame at various points in his career — earning an endorsement from Fox News pundit Sean Hannity and satirical praise from Stephen Colbert. Now, the political and religious painter has created his first work depicting President Donald Trump. 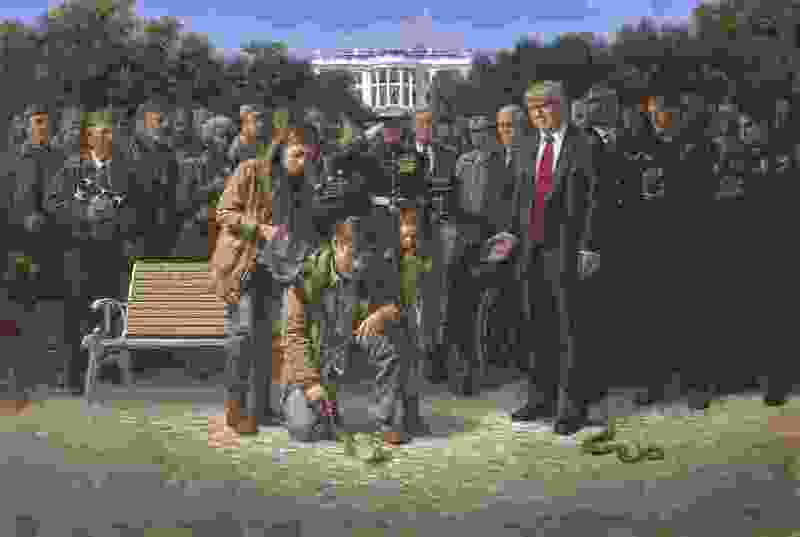 Titled ”You Are Not Forgotten,” McNaughton’s painting features Trump — his foot on a snake — standing over a young family nursing a small plant growing out of the cracked ground. Trump is flanked by police officers, military personnel, miners and others with the White House in the background. The description of the painting on McNaughton’s website discusses neglected veterans, marginalized police officers and suffering families, and praises Trump. Print options for the painting range from $29 to $705. The man coaxing the sprout from the ground is the ”Forgotten Man” featured in other McNaughton paintings. A white man in jeans, loafers, plaid shirt and nondescript brown jacket, the Forgotten Man “represents every man, woman and child of every color and creed who is an American,” McNaughton says on his site, which offers interactive explanations of many of his paintings. An eponymous painting of the Forgotten Man was purchased by Hannity after Trump was elected president, according to the website. That piece showed the Forgotten Man slumped on a bench while then-President Barack Obama stands on the crumpled Constitution while former presidents Bill Clinton, Franklin D. Roosevelt and Theodore Roosevelt look on in apparent pride. A 2012 ”Colbert Report” segment presented a satirical art review of that and other McNaughton works, including “One Nation Under Socialism,” which shows Obama holding up a flaming copy of the Constitution.